Makaney Code is a non profit project, you are free to copy, publish, distribute, sublicense, and/or sell copies of Makaney Code, and to permit persons to whom Makaney Code is furnished to do so as long as in your application you refer to the code as "Makaney Code" or "MKC". Q: How to read the Makaney Code? P1: The direction of the latitude. It can be either South (minus sign) or North (no sign). P2: The latitude coordinate, which can range from one letter or number starting from A (i.e. 0) up to four alphanumeric letters (3BNY = 90.0000). P3: The direction of the longitude, which can be East (plus sign) or West (minus sign). P4: The longitude, which can range from one letter or number starting from A (i.e. 0) up to five alphanumeric letters (BFO7X = 180.0000). Q: How the direction is reflected in Makaney Code? Q: What is the Makaney Code's Base33 alphabet? The alphabets have been ordered to favour a more friendly choice of words in some areas that experience high population density and -- in the same time -- lacks a practical postal code system (such as pilgrimage areas). We exclude 0, 1, and V as they usually mistaken with O, I, and U, giving a more human friendly code. Q: Why Base33 why not Base36 or Base64? The idea is not to produce a short code only, but a code that is short and easy to read, write, speak, and remember. Base36 will be a bit confusing (i.e. 0 or O, I or 1) and Base64 is not human friendly. Q: How to convert the Makaney Code to latitude and longitude? Q: How to convert latitude and longitude to Makaney Code? 1) Multiply the geographic coordinate by 10000 then round it. 2) Divide the result by 33 and map the reminder to its corresponding symbol in the Makaney Code alphabets table. // In your application you refer to the code as "Makaney Code" or "MKC"
// decimalToBase33(Math.round([latitude or longitude]*10000)) return Makaney Code of the coordinate. 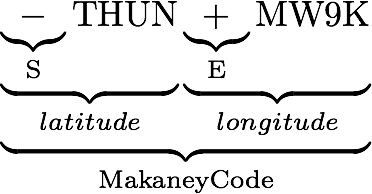 //	makaneyToLatLon(Makaney Code) returns Latitude and longitude up to X digits.